May 27th, starting and ending at Seaport! Here’s your chance to participate and run a memorable Boston route! Commit to 5 miles or a half marathon (13.1 miles) to run historic Boston for a great cause and minimal fund raising requirements!! Both will be fun, exciting and memorable. Run To Remember was created to pay tribute to Boston's fallen Police, Fire and EMT first responders. It has become a forum for other charities to raise vital funds for their organization, while also lending support to Boston heroes. Zack Heger Foundation learned that Parent Project Duchenne Muscular Dystrophy is just one of these notable organizations. We are so pleased they will be able to come to Boston this year and recruited us to help their commitment to finding a cure for Zack’s disease so that future children will not have to suffer the way he has. We are looking for more team members to join us to have a blast in Boston on Sunday, May 27, as we Run To Remember Boston’s finest. This, combined with raising funds for important research to help those suffering with Duchenne Muscular Dystrophy should be a wonderful and heartwarming event. If you are interested in taking on this challenge and joining our team, please go to www.runforoursons.org. Then click on join team, type in “Team Z-Man”. You will be prompted to either join the team, or support one of the current team members. Team Z-Man, PPMD and the entire community of Duchenne Muscular Dystrophy thanks you for taking the time to read about our first ever run endeavor in Boston! Run To Remember....You’ll never forget!!! Please support the fight against Duchenne Muscular Dystrophy by sponsoring Margie and Meghan as they run the NYC Marathon. Donate here. I am running the New York City Marathon (26.2 miles) on November 5th to support Zack Heger Foundation for Duchenne Muscular Dystrophy in effort to find a treatment, cure, or to obliterate this horrible and fatal disease. I am running for Zack, my 25 year old son who has this disease. DMD (Duchenne Muscular Dystrophy) is a 100% fatal disease that afflicts 1 in every 3500 male births. 40% of the cases are random, as was Zack’s. ANYONE can have a child with DMD. It is characterized by progressive loss of muscle strength and mobility and leads to eventual death due to loss of cardiac and lung function usually in the teenage years. We established Zack Heger Foundation in 1995 to try and help efforts to find a cure. Research has helped Zack live with DMD due to all the progressive prophylactic heart and lung therapies. He can no longer move 95% of the muscles in his body, and needs a ventilator to breathe. BUT, he can still talk, smile, chew food, and gratefully use his thumb to control the joystick on his electric wheelchair. Sadly, he recently lost the ability to press the remote control of his electric bed. It is just another loss to add to the lengthy list. Zack requires 100% care…..every day. We don’t know Zack’s future. We continue to enjoy his humor, knowledge and passion for cars, visits from his best friends on weekends, and catching up on all the Netflix series, especially Walking Dead., Most importantly, we cherish his saying “I love you” countless times to all of us daily. We teamed up with Parent Project Muscular Dystrophy 23 years ago. They raise millions of dollars to lobby and push important issues through the FDA , support vital research and provide family support to make a REAL difference in these boy’s lives. Running with me, again, is Meghan Johnson, DPT, a colleague and dear friend. We are asking for donations to Zack Heger Foundation for our RUN FOR OUR SONS, a PPMD charity event. All funds raised will support our unified mission to raise awareness, find treatments, and assist these boys and young men as they navigate living unpredictably longer lives with unique challenges. We ask your support to make a difference and are grateful for ANY contribution. Here we go again! When Margie asked if I’d run the New York Marathon to fundraise for her son, Zack, with Duchenne Muscular Dystrophy, I couldn’t say no (even though I “retired” from the marathon scene after completing Boston in 2014). Having run the Disney Marathon twice for Zack, I thought why not run New York for him too? If he can’t run, let alone walk, my aching knees (after 4 surgeries) won’t stop me. With potentially promising medical breakthroughs that have been achieved through previous fundraising efforts, it truly feels as though I am running towards the cure for Duchenne with the help of your donation. Duchenne is the most common fatal genetic disorder among children, affecting 1 in 3,500 boys, but to date, there is no cure or treatment to stop the progression of Duchenne. My dear friend Zack Heger lives strong-willed every day affected by Duchenne Muscular Dystrophy. It fills my heart with joy to know that at 25 years old he has beat the odds living well past the initial life expectancy of late teens to early twenties. I still to this day get to enjoy his presence and warm personality/smile. I’ll never know more about cars or movies than what I’ve learned from Zack. Sadly, watching TV/movies and/or talking with friends is the extent of what his daily life has become. He can’t explore the world as we all take for granted, and this lack of life should be evidence enough that a cure is critical for these boys. It breaks my heart to know that he may be too progressed in the disease to benefit from current breakthroughs in medicine. While current medicine allows him to continue to breathe with the help of a ventilator, other than talking and managing his electric wheelchair with the use of his thumb, Zack lives a life relying on the help of others 24/7. 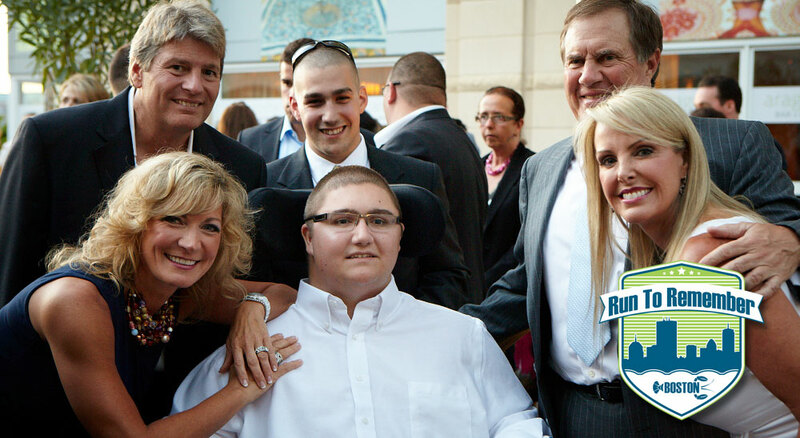 I cherish every moment I get to spend with Zack, and I hope to continue to benefit this organization to help those with loved ones affected by Duchenne enjoy their time together for a lifetime. Please support me through the Zack Heger Foundation as I participate with the Run For Our Sons team at the 2017 TCS New York City Marathon on November 5th. Together, we will go the distance to end Duchenne. Those with Duchenne are truly in a race against time as their muscles deteriorate further each day, eventually leading to heart and lung failure. Please help us put an end to the devastating disorder by making a donation. All donations go directly toward researching a cure, and your contribution is 100% tax deductible. Any amount, great or small, helps in the fight. I greatly appreciate your support and will keep you posted on my progress. Together we can end Duchenne once and for all.